This is a typora theme inspired by Vue document style. Typora is a markdown editor and reader that supports real-time preview. It supports Windows, macOS, Linux platforms. Typora is a qualified Markdown editor that supports images, lists, tables, codes, formulas, catalogs, etc. At the same time, typora also supports (one-click) dynamic preview function, so that everything becomes so clean and pure. And there are various theme templates. typora-vue-theme inspired by Vue document style. Download this theme from Github, then you can get the vue.css, vue-dark.css files and the vue folder. Open typora. Click "Open Theme Folder" button from Preference Panel → Apperance section. Put vue.css, vue-dark.css and vue folder into the opened folder, make sure your css files are directly under that directory. Close and reopen Typora and select Theme → Vue or Vue Dark from the menu bar. 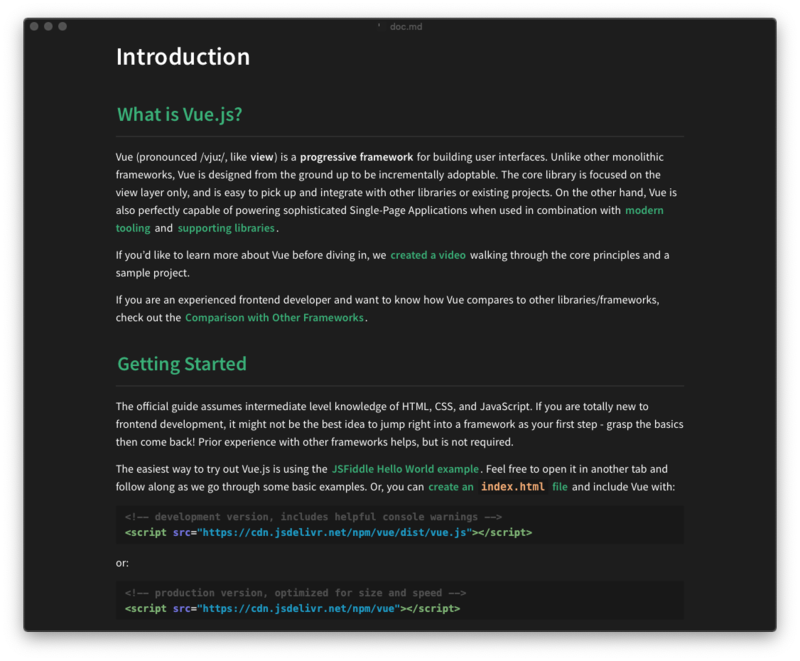 Thanks: This vue-dark.css by typora-vue-dark-theme.